Kashi Vishwanath Temple is located in Varanasi (Banares), Uttar Pradesh, India. It is one of the oldest temples in India and in Devanagri language it is written as काशी विश्वनाथ मंदिर i.e. Kashi Vishwanath Temple. The prime deity propitiated in the temple is Lord Shiva and the main festival celebrated here is Maha Shivratri. The current structure was built in the year 1780 by Maharani Ahilyabai Holkar. As one of the most famous Hindu temples in India the temple stands erect on the holy Ganges as one of the twelve Jyothirlingas. The temple is considered extremely sacred and thousands of devotees throng the temple every year to seek blessings of Lord Shiva who is present here in the form of Vishwanath or Vishweshwara. 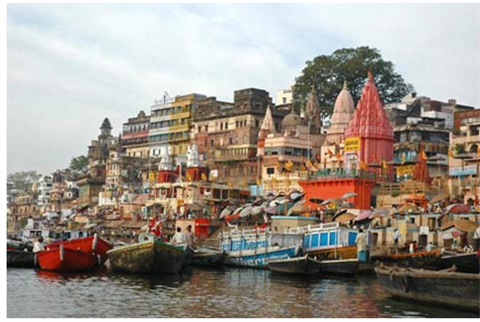 The city of Varanasi, where the temple is located, is the oldest town as per historical records. Around 3,500 years old Varanasi was earlier known as Kashi and the temple was thus named after the place as Kashi Vishwanath Temple where Vishwanath stands for the one who is the ruler of this universe. The temple has been demolished and restored under the reign of foreign rulers (especially Muslims) in India. In the year 1194 CE the original Kashi Vishwanath Temple was ruined by the army of Qutb-ud-din Aibak during a battle against Raja of Kannauj. During this time he was the commander of Mohammad Ghori. Later, a Gujarati merchant (name unknown) rebuilt the temple during the rule of Shamsuddin Iltumish amid 1211-1266 CE. It has not been exactly recorded, but either during the rule of Hussain Shah Sharqi (1447-1458 CE) or Sikandar Lodhi (1489-1517 CE) the temple was again demolished. During the reign of Emperor Akbar, Raja Man Singh again rebuilt the temple. In the year 1585 CE, Todarmal again reconstructed the temple at its earlier site. Archaeological records say the last structure of the temple was dismantled by Aurangzeb in the year 1669 CE who built the Gyanvapi Mosque on the exact site. Later, in the year 1780, Ahilya Bai Holkar, Maratha monarch of Indore established the current structure which stands adjacent to the mosque. The erstwhile rear, foundation and columns of the temple can still be found in the present mosque. It is believed that the Maratha ruler Malhar Rao Holkar planned to destroy the whole mosque but the plan never got implemented. The ghats, Gyanvapi well, and other smaller temples were constructed between 1833-1840 CE. The gold for the temple was donated by Maharaja Ranjit Singh. Since the year 1983 till date the whole management of the temple has been looked after by the government of Uttar Pradesh. As per the legend mentioned in Shiva Purana, there arose an argument between Lord Brahma (The Creator) and Lord Vishnu (The Maintainer) over the supremacy of creation. Meanwhile, Lord Shiva appeared as a sovereign authority on a huge fiery pillar which ran through all the three worlds and was endless. As part of the test, Lord Shiva asked Lord Vishnu and Lord Brahma to locate the head and tail of the pillar respectively. During this time, Brahma lied that he had found the tail of the fiery pillar while Vishnu conceded defeat. Immediately the furious Shiva appeared as another fiery pillar and cursed Brahma that he would not have any place in Hindu religious ceremonies. Simultaneously, he appreciated Vishnu’s honesty and said that he will be propitiated till eternity. In Indian religious history, Vishwanath or Vishweshwara Jyothirlinga has tremendous significance. It is said that a devotee can attain the virtues of all 12 Jyothirlingas combined by visiting Kashi Vishwanath Temple and paying obeisance to the Shivlinga in the temple. As mentioned in our ancient Indian scriptures, a visit to Kashi Vishwanath Temple along with a holy bath in the Ganges leads to Moksha i.e. salvation. Paying obeisance to Lord Kashi Vishwanath is followed by a ritual in which a devotee is supposed to renounce any one of his desires to gain the maximum results from this visit. Thousands of people visit the temple during normal days. While on occasions, millions visit the temple on a single day. There is an old tradition in which devotees first visit the Kashi Vishwanath Temple, pay their obeisance to Lord Shiva, collect water from the holy Ganges and straight visit down south to propitiate Lord Rameswar in South India with the Ganges water. As part of the ritual, devotees also take back along with them sand samples spread around the Rameswaram Temple. A visit to Kashi Vishwanath Temple gives freedom from the gruelling cycle of life and death. If a devotee takes his last breath here, Lord Shiva himself whispers the salvation mantra in his ears. Also at the same time the devotee is directly taken to the holy abode of Lord Shiva at Mount Kailash instead of being taken by Yama. This is because one gets the blessings of Lord Shiva who himself is symbolic of the death and destruction for the spiritual evolution of mankind. Lord Shiva entered Kashi through Manikarnika Ghat located on the banks of River Ganges. The Ghat is present near the Kashi Vishwanath Temple and is one of the famous Shakti Peethas and visited regularly by Shakti worshippers. All Shakti Peethas have an associated story of King Daksha and his daughter Sati who set herself on fire in the yagna performed by her own father. The story of Shakti Peetha is also found mentioned in Shaivite literature. In symbolic interpretation, Lord Shiva partly appears out of Jyothirlinga which itself is a Supreme single reality. All Jyothirlingas are those places where Shiva emerged as a fiery column of light. It should be noted that the 64 forms of Lord Shiva not be confused with the 12 Jyothirlingas. Each Jyothirlinga is a separate form of Lord Shiva in the form of infinite Stambha pillar. Shivratri, the main Shiva festival which commemorates the pious wedding occasion of Lord Shiva and his beloved consort Parvati, is celebrated with pious rituals and traditions. On this special occasion Kashi Naresh (the King of Kashi) acts as the officiating priest. He is the first to perform the puja and all other related rituals in the sanctum sanctorum before anyone else could enter the place. The importance of Kashi Vishwanath Temple is tremendous in Hindu religion. Leading Hindu saints namely Goswami Tulsidas, Vivekananda, Adi Sankaracharya, Ramakrishna Paramhansa, Swami Dayananda Saraswati, Swami Vivekananda, and Gurunanak had visited Kashi Vishwanath Temple in the past. A sacred well located between Gyanvapi Mosque and Kashi Vishwanath Temple. The main shrine is a quadrangle flanked by other shrines. Around the temple complex there are smaller shrines located and the whole lane is thus known as Vishwanath gali (lane).The Lords placed in different shrines inside the temple complex are Virupaksh Gauri, Virupaksha, Dhandapani, Avimukteshwara, Vinayaka, Vishnu, Sanishwara, etc. A tall Shivlinga, 60 cm in height and 90 cm in circumference, is placed on a silver altar. There is immense significance of a well named Jnana Vapi or Gyaan Vapi located to the north of the main shrine. As per the legend, the present Jyothirlinga of Kashi Vishwanath was found in this well. It is also said that once during a foreign invasion, the presiding priest of the temple dived into the well along with the Jyothirlinga. Also present inside the temple is Sabha gurh (congregation hall) stretching and leading towards inner garbha (sanctum) is also an interesting attraction. 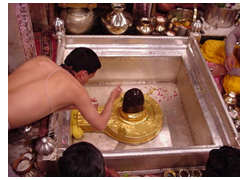 The main black coloured stone Linga is enshrined inside the sanctum sanctorum and is installed on a silver platform. The temple structure is basically composed of three distinctive parts. The first one is a spire of Lord Kashi Vishwanath, the second is gold dome and the third one is gold spire at the top propping a flag or trident. In total the temple has three domes and each is made up of pure gold and hence the temple is also known as Golden Temple, also because of the fact that it resembles Golden Temple of Amritsar. There is immense popularity of Kashi Vishwanath Temple in every part of India. In fact the architectural styles of many Indian temples have been inspired from this temple. All the offerings made by devotees are mainly distributed amongst poor.